Ours is an ancestral religion, one passed down to us from our forebears from ancient times and thus tailored to our unique makeup. Its spirit is inherent in us as a people. If the People of the North ceased to exist, Asatru would likewise no longer exist. It is our will that we not only survive, but thrive, and continue our upward evolution in the direction of the Infinite. We would impose Asatru on no one. But we earnestly invite those whose heritage it is, to return to the belief that is a part of them as surely as blood and bone. 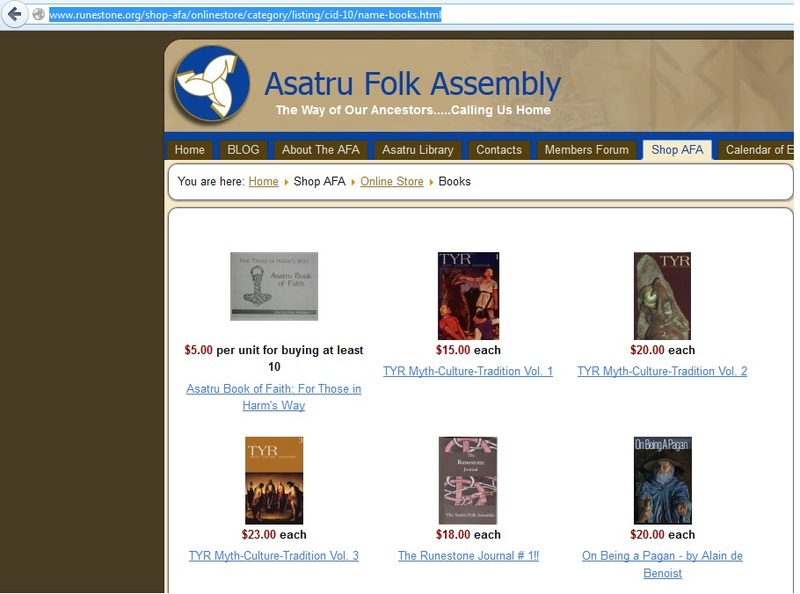 Asafolk have traditionally been restrained when it comes to seeking converts. However, we do feel that our brothers and sisters will be healthier and happier once they have returned to the religion that expresses their heritage. Also, we need them! The restoration of our ancient ways, and the building of a secure future for our religion and our people, is a huge undertaking that can use all the willing hands we can find. For these reasons, we call our kin to rejoin the great family of men and women who honor the sacred ways of the Northland. Which bears considerable resemblance to the central tenets of Dutch ultranationalist theoretician Dr. Abraham Kuyper, one of the key figures in the development of Afrikaner nationalism in South Africa. Kuyper argued for, “a nationalism of separate, unique national identities as created by God”. According to Kuyper’s theories it was necessary for these divinely-mandated nations to maintain their cultural and linguistic purity. These beliefs very rapidly saw racialist elements easily grafted on by the late 19th century Afrikaners who were already inculcated in similar ideas via Afrikaner Calvinism justifying their treatment and enslavement of the native Africans. While these central principles demonstrate a strong tie with white nationalist themes of victimization further evidence shows the connection between the AFA and American neo-fascism runs far deeper. In 1998 the Southern Poverty Law Center reported one of McNallen’s key organizers had proven ties to the national socialist movement: Ronald Schuett, the guildmaster of the Teaching Guild. Schuett, prior to his affiliation with the AFA, was the Colorado state organizer for the neo-Nazi SS Action Group and once told a reporter while wearing a Nazi uniform,”I’m a white racist and proud of it”. He was also believed to have connections with the Hammerskins, a notoriously violent white supremacist skinhead gang. The first demonstration of action by McNallen to prove his fidelity to racialist ideology was his involvement in the Kennewick Man controversy. The issue erupted when unidentified remains were discovered in Washington State on July 28th, 1996. The Umatilla tribe demanded the remains be handed over as part of the terms of the Native American Graves Protection and Repatriation Act. A group of anthropologists sued the US government for the right to perform DNA testing leading to a court battle between the anthropologists and the Umtailla. McNallen waded into the controversy arguing, “While we share the belief that the government has no right to keep anthropologists from studying the Kennewick Man, we continue to seek mitochondrial DNA testing to determine his genetic links to our European ancestors.” Stephen McNallen’s legal efforts were spearheaded by attorney Michael Clinton, a known supporter of Holocaust denier David Irving with ties to skinheads and the American Front who was the editor for McNallen’s(2) short-lived Wolf Age magazine. On August 20th, 1999 the AFA had their day in court arguing Kennewick Man was one of their own to justify their claim to DNA testing. The court ruled otherwise and their request for DNA testing was denied. Scientists later concluded the sample was so old it had no viable DNA samples for testing. In 1997 McNallen further affirmed his connections to the white nationalist movement when he married Sheila Edlund. Valgard Murray, co-founder of the Asatru Alliance, performed the ceremony blessing the new couple while Blood Axis frontman Michael Moynihan performed for the guests. While on the surface the wedding doesn’t seem like much out of the ordinary as far as Pagan and Heathen ceremonies go, much more than meets the eye was going on there. Valgard Murray has a long and proven past with the racialist movement. He first became involved in the racialist scene in the late 1960s when he first came into contact with Odinism. In the 1970s Murray would co-found the Arizona Kindred with Elton Hall, the man who first introduced him to Odinism and the American Nazi Party’s state organizer(3). 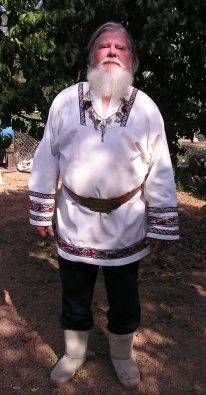 In 1976 the Arizona Kindred would become the first kindred to be certified by Else Christensen’s Odinist Fellowship with Murray later serving as organization’s vice president(4). 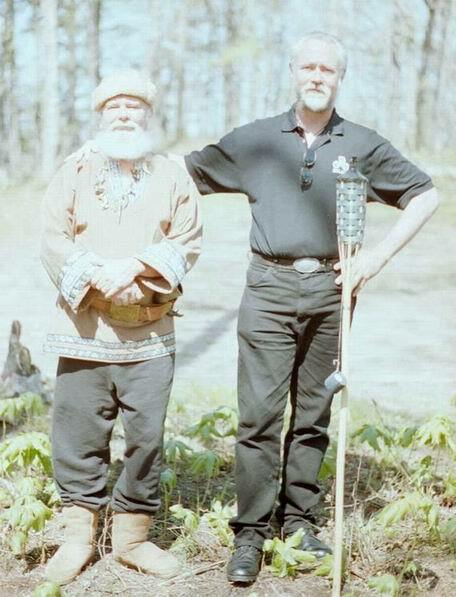 Following the collapse of the old AFA Murray partnered with Tribe of the Wulflings founder Robert Taylor to found the Asatru Alliance in 1988(5). The structure of the Asatru Alliance was based on the system used by outlaw biker gangs of hangaround kindreds, probationary kindreds, and full members; not surprising considering Murray’s past history as a spokesperson for the national socialist Iron Cross outlaw motorcycle club(6). Moynihan, is a well-known member of the modern neo-fascist movement. As the face of the neo-fascist group Blood Axis Moynihan is a long-time member of the American New Right. Contrary to the usual stereotype Moynihan is not a blood-hungry bruiser but a slick intellectual operator. 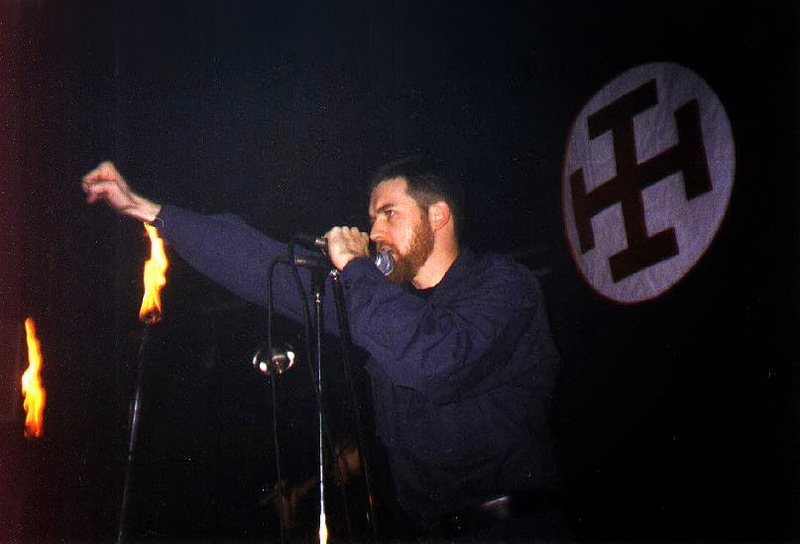 Aside from his role as the frontman for Blood Axis and work on other neo-fascist musical acts Moynihan works to help disseminate neo-fascist thought. In 1992 he edited and provided the introduction for the book Siege, a collection of the writings of neo-Nazi James Mason. He followed up in 1995 with the publication of Lords of Chaos, a book about the black metal subculture. In it he argues the entire sub-culture was an expression of the suppressed atavistic archetypes of the Nordic psyche(7). Moynihan has continued to focus on the more mystical elements, working with Edred Thorsson on his translation of of the works of Karl Wiligut, Heinrich Himmler’s personal occultist, as the editor of The Secret King: Karl Maria Wiligut, Himmler’s Lord of the Runes which was first published in 2001. He also edited a translation of Julius Evola’s Men Among Ruins, a book that calls for a violent counter-revolution to overthrow democracy and replace it with a fascist warrior society. Evola, an Italian fascist philosopher whose works are the foundation of modern radical traditionalism, is a particular favorite who shows up much more frequently in Moynihan’s later projects. In his later work with Joshua Buckley at the radical traditionalist journal Tyr, who published their first issue in 2002, Julius Evola’s writings are a popular subject along with the works of famed French New Right thinker Alain de Benoist. All three volumes of Tyr‘s issue collections are available, among other places, at the AFA’s online store in the books section which is not too surprising since McNallen contributed to Volume 2. Since founding the AFA on such principles in 1994 and solidifying his ties to the movement in the later part of the decade McNallen has continued to advocate for veiled, family-friendly white nationalism. Posing as defenders of a genuinely multicultural world McNallen, using the AFA as a support base and megaphone, has worked to blur the line between fascist, radical traditionalist politics and Heathen spirituality. If anything as time has gone by he’s grown bolder and more outspoken. 3. Mattias Gardell, Gods of the Blood, the Pagan Revival and White Separatism, (Durham and London: Duke University, 2003), 261.